Monday saw the start of Alcohol Awareness Week (19–25th November 2018): 7 days of awareness-raising and campaigning for change. In January 2016, the UK’s Chief Medical Officers published new ‘low-risk’ drinking guidelines to help minimise the risks associated with drinking alcohol. Did you know that the advice is to not drink more than 14 units per week, spread over 3 or more days and with a few days off? This equates to roughly six pints of lager or one and a half bottles of wine. Every year thousands of lives are lost and hundreds of thousands damaged as a result of alcohol. It’s time for change: at an individual, community and national level. AlphaBiolabs can help change behaviours with its comprehensive range of alcohol testing solutions. The range includes point-of-care breath tests, blood analysis and 3- or 6-month hair analyses to show alcohol consumption over a period of time. Continuous results are also available using an innovative alcohol monitoring bracelet. 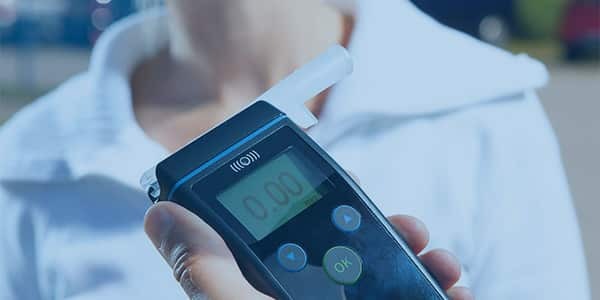 After blowing into a breathalyser, the breath alcohol concentration (BAC) is given as a digital readout. The BAC shows the level of alcohol in the breath at the time the test was taken. This method of testing is therefore ideal to check for current alcohol consumption. It is used regularly in the workplace for post-incident and for-cause testing. Blood testing can determine whether a person may have drunk to excess over the course of the last 4 weeks. This is achieved using a Liver Function Test (LFT) to assess the variation of liver-produced proteins in the blood, combined with the Carbohydrate Deficient Transferrin (CDT) test that looks at a specific biochemical marker for alcohol consumption. A longer history of alcohol consumption can be achieved by looking at two metabolites of alcohol in head hair: ethyl glucuronide (EtG) and fatty acid ethyl esters (FAEEs). These biomarkers are incorporated into the hair via sweat (EtG) or sebum (FAEEs). Depending on the length of hair, 3- or 6-month analyses can be performed. Body hair can also be tested to give an overview of up to 12 months, although this test only measures EtG. AlphaBiolabs would always recommend that a blood sample be taken to complement the FAEE/EtG test. Nail clippings can also be analysed to provide up to a 6-month overview of alcohol consumption. This is because consumed alcohol circulates in the bloodstream and a proportion of it and its metabolites becomes incorporated into the keratin that makes up nails. Toe nails as well as finger nails can be analysed. SCRAM Continuous Alcohol Monitoring® is an ankle bracelet that detects around-the-clock alcohol consumption in real time. As such, this test can pinpoint alcohol use at the exact time of day and on which day. It can be used for as many months as needed. For expert advice on alcohol testing solutions, please call 0333 600 1300 or email us at info@alphabiolabs.com.